Living in Peru, watching baseball without MLB.tv was hard. We usually only got two chances a week to see a game: either Wednesday night or Sunday night – and that if it wasn’t football season. It was a year after I got in the game; a friend of mine told me that I had to see this amazing southpaw pitcher from the Yankees: Randy Johnson. And Randy was incredible. But that night he was no match against Roy Halladay. 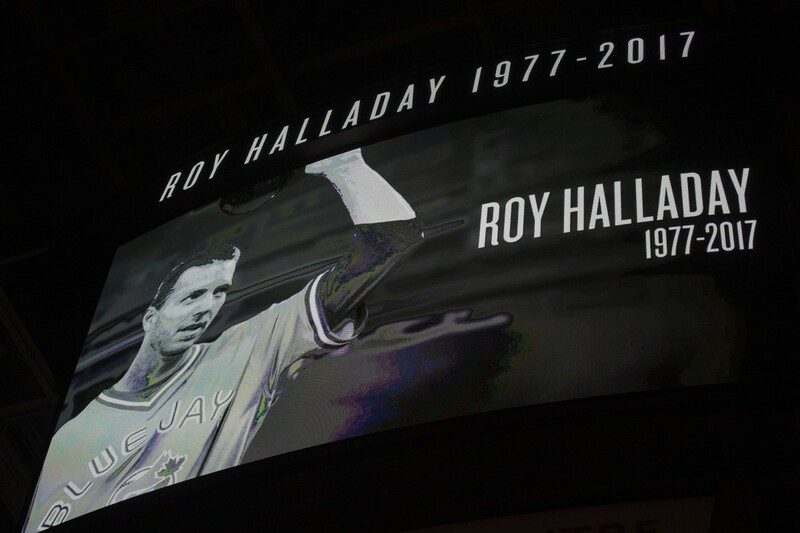 That was my first Halladay start: a complete game, three-hit shutout of the New York Yankees. Yes, I know this is a Yankees website but, for all the rivalry there has been between against other teams and players, we’ve always known when to show respect to the greats. Aside from Jorge Posada, Tino Martinez, and Hideki Matsui, Doc struck out every batter in the Yankees lineup, collecting nine for the night. His only blemishes of the night were two singles, a double, a walk, and a hit by pitch, but all five base runners were left stranded, with only two of them reaching second base. At no point during the game did the Blue Jays have less than a 41 percent chance of winning. That’s how good they were when Doc took the mound. But there are three at-bats – which unfortunately I could not find video replay of – that have stuck in my mind from that night. The first two were the swinging strikeout to Tony Womack, followed by the Gary Sheffield line out to center. It was the bottom of the third and, after being held hitless the first two innings, Doc opened up the inning by hitting Martinez. Bernie Williams struck out the following at-bat. Derek Jeter came up after him and hit a 0-1 ground ball up the middle to put Halladay in his first jam of the night. With two runners on, and one out, here came the heart of the order for the Yankees. Halladay started with a ball, and the next pitch was fouled off. With a 1-1 count, Halladay threw two consecutive balls to give Womack a hitter’s count. The next pitch was again fouled and things seemed to even out. You could tell that Doc was in a fighting to get out of the jam. Halladay stood in the stretch. The pitch came. Runners were going. Womack struck out swinging, and with two outs now in the inning, runners were at second and third. At this point, the Yankees had a 57 percent chance of winning. Unfortunately, Gary Sheffield would line out to Vernon Wells on the first pitch he saw, getting Halladay out of the jam and keeping the score at 0-0. The third at-bat, and final strikeout, however, was the one that basically shut the door for the Yankees. Once again it was Sheffield standing at the plate. Matsui was in the on-deck circle and Rodriguez was waiting in the hole. The Yankees 3-4-5 guys were about to get their last chance at Doc. You could just feel the tension that the game could become a one-run game, could be tied or could be won by any of the three. But Halladay was having none of that. He started Sheffield with a ball – his 103rd pitch of the night. He quickly came back to tie the pitch count on a called strike. Sheffield fouled the next pitch before he was caught looking on the final pitch of the at-bat. By that point, you could feel that no matter who followed, nobody was scoring on Doc. Perfection was not achieved that night, but I met a pitcher who embodied it. Halladay became one of my favorite players and no matter who he faced, even if it was your favorite team, you wanted to root for him because rooting for him was rooting for perfection. Nobody drove himself as hard. Nobody could cause hate, anxiety, relief, and joy to the same person within a single game – whether you were for or against him. Doc will be dearly missed. But we must be thankful for the time he dedicated to the game, to its fans, to his community. We were fortunate that he allowed us to borrow so much of his time. And we were fortunate to see him reach perfection, both on and off the field.